Release Date: 2003 Running Time: 52 mins. It’s the holiest place on earth for all of the major Western religions and has been the subject of wars for milennia. The Temple Mount Is Mine, Part 1 presents the compelling history of the famous Jerusalem site and explains its importance from the perspectives of all three religions. “There is a saying, ‘Whoever rules over the mount, rules over Jerusalem,’” a rabbi explains “and whoever rules over Jerusalem rules over the holy land.” His words point to the main question underlying the constant conflict in the Middle East: who wouldn’t want control of the holiest place on earth, and how far will they go to get it? All three major Western religions trace the beginning of the world and the creation of the first man to the Dome of the Rock on the Temple Mount. On the same site that King David and King Solomon ruled, Jesus worshiped and Muhammad ascended into Heaven. Full of stunning cinematography, the documentary captures the aesthetic beauty of the Holy Land as both religious leaders and average citizens explain the personal and historic importance of the Temple Mount. Judaism considers the Temple Mount, the site on which King Solomon constructed the first Holy Temple, to be the closest a Jew can come to approaching God in the physical world. Although the Babylonians destroyed Solomon’s Temple, the Second Temple was built soon afterwards. That, too, was destroyed, in 70 AD by the Roman army, led by Emperor Titus. Ever since then, Jews have been mourning the loss and awaiting the construction of The third Temple. 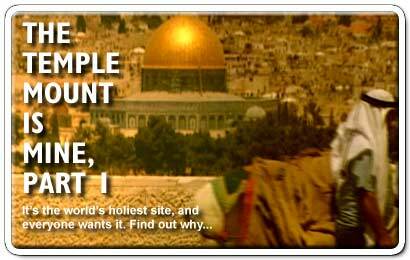 The Temple Mount Is Mine offers truly stunning footage of Jerusalem. White wild flowers blossom from the cracks of the Wailing Wall, which has stood for centuries, and the masses that come to pray near it add to its beauty with their reverence. Aerial shots of the city show the Dome of the Rock, hovering high above and glistening in the Middle Eastern sun. The camera also captures close-ups of the detailed mosaic exterior, which blends elements of Roman, Byzantine, Syrian, Hellenic, and Persian architectural elements, demonstrating the undeniable beauty of this Muslim house of prayer. But the aesthetic beauty of the site contrasts with the animosity that has existed there for centuries. Through countless wars and battles, and many changes of hands, the Temple Mount’s history contains mostly conflict. The documentary explains how the Holy Land’s long and turbulent history fuels the conflict over the Temple Mount. “We are not authorized to give up a heritage of our ancient fathers, who paid for thousands of years with self sacrifice,” a rabbi explains. The territorial argument extends as far back as the religions’ formations. “The Bible is our document, our right to this place,” a Jewish man insists. Muslims interviewed in the film differ. The Temple Mount Is Mine recognizes how deeply rooted the conflict between the competing religions is, but some interviewed in the film suggest that the struggle for peace is not hopeless. One monk says that Christians in the Middle East could naturally serve as a bridge between the Jews and Muslims. While they share the Bible with the Jews, many Christians are Arabs and share a language with the Muslims. As this monk sees it, Christians’ unique position should make them leaders for peace. But many in the Jewish community wonder whether Arab Christians are truly honest brokers between Jews and Muslims. The documentary suggests that the basis for all religious feeling is reassurance that one is not alone. Religion unites a group of people and promises that an unseen God is ever-present. Jews, Muslims, and Christians all benefit from this sense of community. But, ironically, just as religion unites, it can also work to divide. The more adamantly Jews believes that the Temple Mount has been rightfully bequeathed to them by God, the angrier they are that Muslims have control of it. Throughout its history, this constant anger over who controls the Temple Mount has boiled into hate and erupted in violence, staining the Temple Mount with blood.